The Antarctic summer has begun: the sun makes a complete circuit above our head every day, never dipping below the horizon. 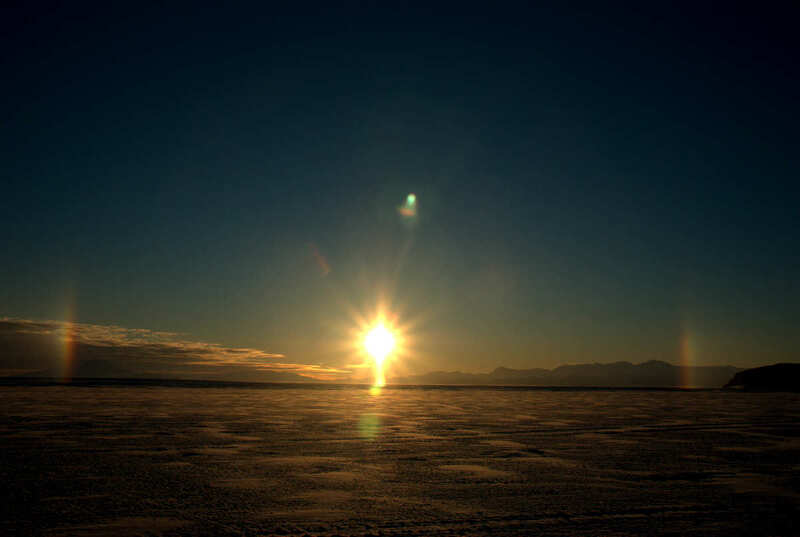 The light effects on the edge of the photo are called sundogs, formed from ice crystals in the air. The summer sun, in its seemingly-perpetual circling of the southern-most continent, like a halo being drawn and redrawn across the margins of the sky, has begun its deconstruction of the frozen seas. The sea-ice edge creeps closer into Erebus Bay, the once frozen and hard layer of ice being stripped clean off the surface, revealing the depths of ocean below. The northern-most edges of Ross Island, not long ago like a mountain rising from a plain, now lay bare to the wind-tossed sea. The melting ice must bring joy to the Adelie penguin's heart, for no longer does this short, excitedly gesturing penguin have to traverse miles on the ice upon its short legs to find its colony at Cape Royds. Now, the hurried penguin can take a relatively short waddle-jaunt to claim its prime nesting spot in the colony. Adelie penguins chillaxin' on the sea-ice edge. Royal Society Range in the background. Adelie penguins on nesting site at Cape Royds. These are the early arrivals, getting the primo nesting spots. There was endless squabbling over pebbles and stones as one penguin would steal a stone from someone else's nest to build up its nest. Lots of emphatic displays, gesturing, and guffawing. Further inland (or "inice," as the case is here), vast stretches of flat frozen ocean still lay firm and strong. As the summer slowly sneaks forward, the tidal cracks along the edges of the islands like Big Razorback and Tent Island, and along the coast of Ross Island at Turks Head and Hutton Cliffs, begin to widen. Mush pools form, areas of...well...mush. The melting ice gathers in depressions creating these pools of thick porridge of ice and water, much like the consistency of a tropical fruit smoothie. And in these mush pools and tidal cracks, the Weddell seal pups are learning to swim. Mom and pup in slush pool...they often just lay there for hours. What a wonderful post! I was just going to complain about the long dry spell. Glad I didn't! This was worth the wait. Love the embedded videos. Except for the sound, you wouldn't guess it was so windy! No waving grasses or tossing treetops give it away. FYI, back home it's also windy and cold today--50F (ha!). It is almost beyond belief that there's a mammal mama out there subjecting her baby to a soak in icy slush. Love the photos of the Adelie penguins, standing, lying around, getting ready to lay eggs, unperturbed by your presence. Looks like an arctic version of a Galapagos-style paradise! Thanks for sharing. Please--MORE. So cool...love those penguins but the pups are kind of cute too!!! Are the skuas still around? 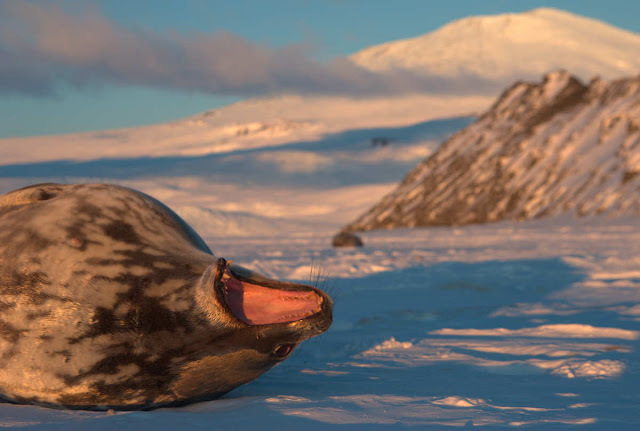 While viewing the yawner, I slowly angled my display and watched sunset light encroach on Antarctica. Will you leave before the sun sets? Probably not...I won't ever see an Antarctic sunset again! Never thought about that before. It will be a very exciting moment...getting to see the sun set, evening creeping in, and then the stars! I miss those stars! The skuas have greatly multiplied...there are hundreds now throughout our study area. To me, they are a blend of a gull, turkey vulture, and eagle. They are the only birds here and they eat whatever they can get, and are very good at cleaning up the seal carcasses. Very beautiful. I hope in the Arctic such as the beautiful landscape. Long thought whether to go and decided At last. I bought a round on this website https://poseidonexpeditions.com/arctic/ . I hope not wasted.